This is one of the hardest blog posts I have had to make, but it is all good. 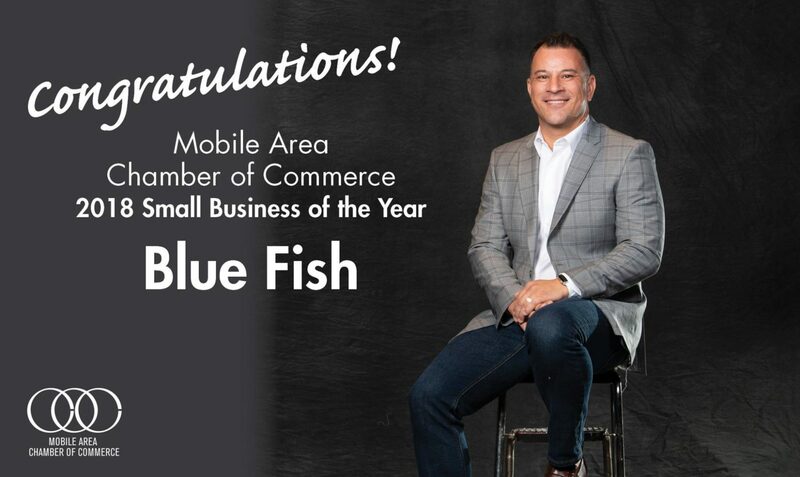 Almost two weeks ago, Blue Fish was awarded Small Business of the Year by the Mobile Chamber of Commerce. To be completely transparent, I still get a bit choked up when I think about what this award represents. Any small business owner knows the ups and downs that go with trying to get a business off the ground. Blue Fish is no different. How do you put words to the years and years of hard work? The years of trying and failing till it finally clicks. But even after it clicks, there are still ups and downs. If you were not at the awards ceremony I will link it down below. Watch it and you will find a Marcus that is without words. They did not tell any of us who the winner was. And I think extremely highly of both Harper Technology and Lagniappe. Abe Harper is like a brother to me. When I have a decision to make or need a sounding board, he is there. Getting recognized as a finalist opened up the door to get to know Rob and Ashley, and I think they are stellar human beings. What they do for this city is difficult and powerful. So my money was on one of the other groups getting the award. So when they announced that the winner was Blue Fish, my mind went blank and I think my heart stopped, if for only a second. I am just thankful that I was able to make it to the stage and say a few coherent sentences. If I were given a chance to make that speech again, I would say thank you. I would thank my team. They are the ones that I lean on daily. They work behind the scenes to make sure everything is handled. They also work really hard to make me look good, which is a difficult job in itself. They come up with amazing ideas for both Blue Fish and our clients and I cherish what each of them brings to the whole. I would thank the numerous businesses that trust us with their work. Without our clients we would all be… unemployed. We take our role in the success of the businesses we work with seriously. We strive to move the needle for them and help them achieve their goals. I would also thank the rising entrepreneurial class that is going to transform this city. I am encouraged every time one of you takes a chance to move your business forward. Lean into your abilities. You have a lot to offer. You are going to make mistakes. We all do. Fail often and fail fast. Learn from those failures and move forward. And I would thank the Chamber. I often get asked whether being a member is worth it. I am continually in awe of the things you are doing for this city. You advocate for the city with larger businesses, trying to get them to move to Mobile. You encourage and educate business owners, helping them become the best they can be. You provide a multitude of platforms for businesses to share their offerings with other business owners. The work you do does not go unnoticed. To close, Blue Fish is growing. The business we are today is not going to be the same business 6 months from now. Nor should it be. One of the things I love most about running a business is the opportunity for growth. Growth in its many forms. Revenue, staff, clients, expertise, skills, opportunities. This award pushes me to grow in ways I could not have imagined before… So thank you. Marcus Neto founded Blue Fish in 2004. He has worked in the technology industry for over 20 years. You can find him on Twitter, Facebook, and Instagram. Or if you want to get in touch for a project email is great.